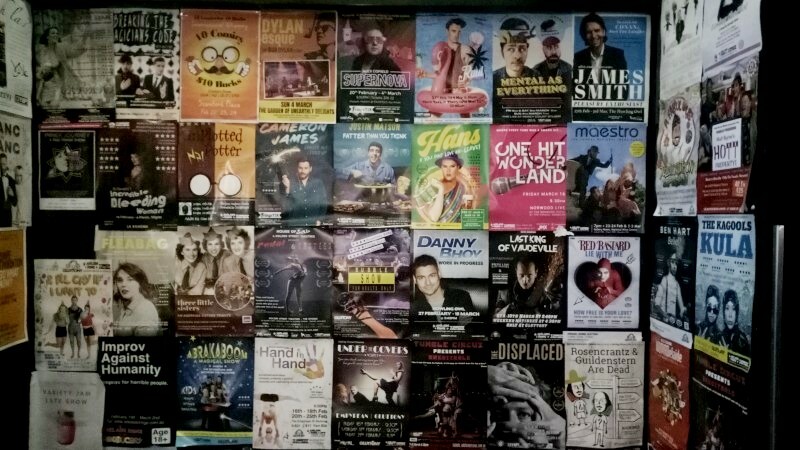 I was in Adelaide and the Festival Fringe was on (the Adelaide Festival and Fringe is every year these days). 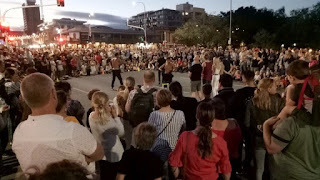 I didn't manage any shows but we did hang around one evening at the East End of Rundle Street, generally a cool area at any time, but at this time the location for the Garden of Unearthly Delights and its food and drink and buskers and also some paid shows in tents and the like. 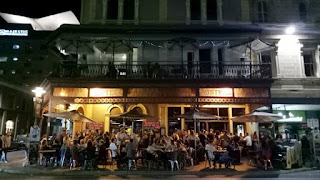 Around the corner was the now common light show on the stately stone buildings of North Terrace. Down the road were the closed streets for the Clipsal 5000 road race, due sometime soon Most excitedly, Dweezil Zappa (son of Frank) was playing a few night later (sadly when I was flying back to Canberra) and over the following week, the reformed Cold Chisel (another excellent Adelaide-originated band) and Grace Jones on the Wednesday. Sad to miss this stream of favourites. I did catch a few loud notes of the Meatbeaters (see pic) but in a room too small and at a volume too loud. Here are just a few pics to display ambience. 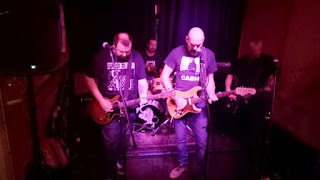 Sunday, first blues jam of the year I don't get to too many, but I enjoy the simple immediacy and the great gear these guys inevitably provide. My bass sounds so nice. My fave was Mesa-Boogie with 6x12 (?) Today it was a quad box with a digital head. Strong and fat; great gear. The host band was excellent, too. 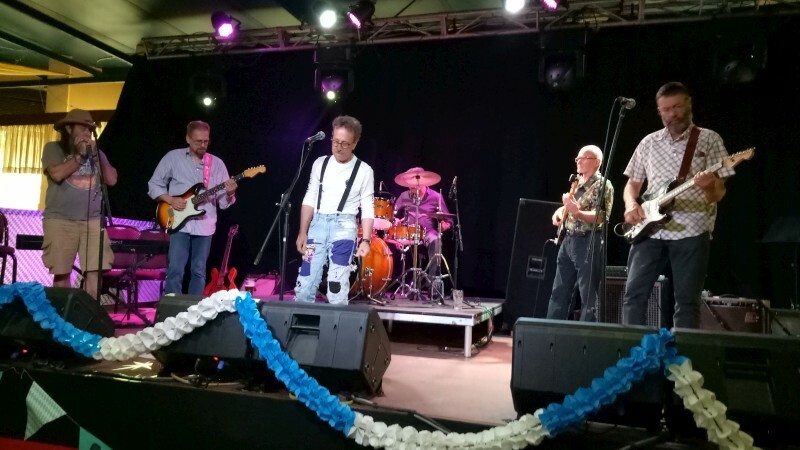 The Pat Powell band, with Pat Powell singing, our local stalwart Mitch Preston and Sydneysiders Rowan Lane and Illya Szwec. Some great vocals, heavily thumbed bass (Rowan plays reggae, too) and some very slick guitar from Illya. 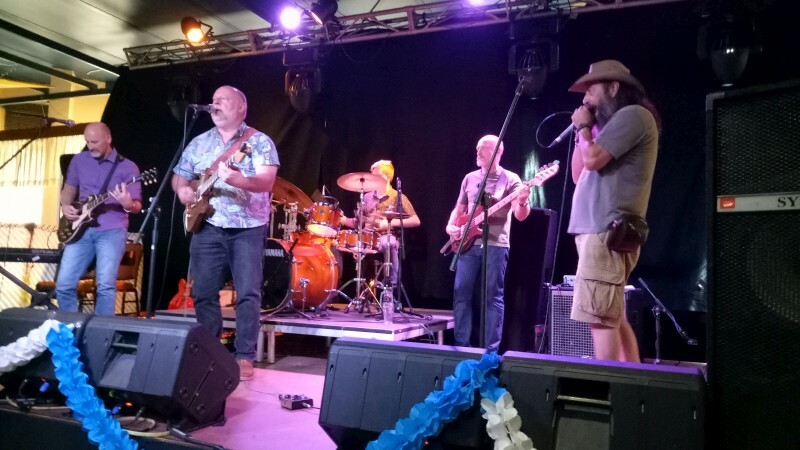 I was seriously impressed by some wah guitar later, but generally this was very sweet., Otherwise, a string of blues jam bands, not least the one I played in. Perhaps the feature was the reformation for the day of Whistler's Father (now Grandfather) playing Hendrix. How can any blues fan not swoon? Lots of fun if perhaps too loud for my tender ears. Here are pics of all the bands other than mine. I was too busy for obvious reasons. 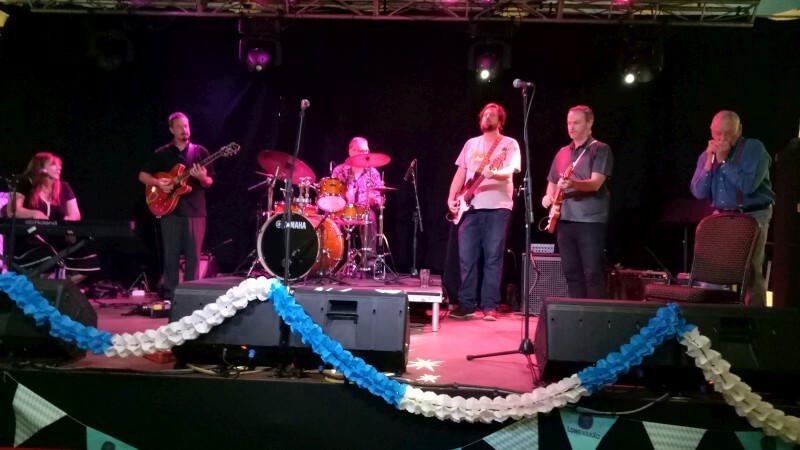 The Canberra Blues Society hosts a jam on the 3rd Sunday of each month, Harmonie German Club, 2-5.30pm. 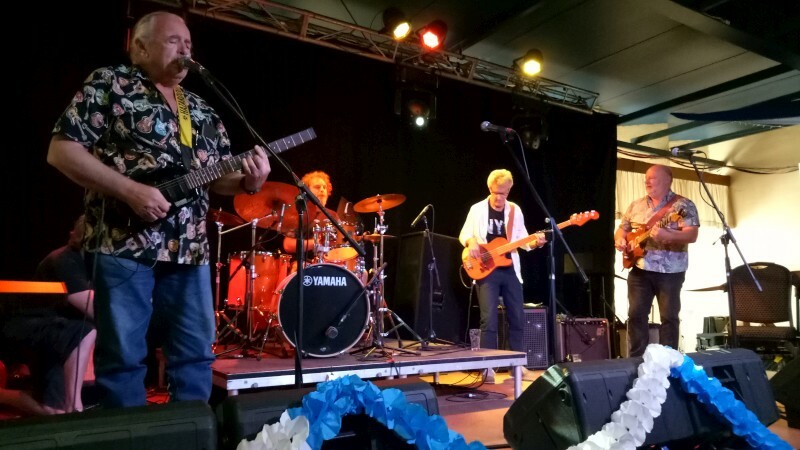 Today's host band was Pat Powell (vocals) with Illya Szwec (guitar), Rowan Lane (bass) and Mitch Preston (drums). Chris Botti has something for everyone. But passing comment caught my attention, about learning how to introduce songs. He'd watched some big names that he'd played with to learn how he now chats and mixes with the audience. There's nothing worse than "that was ..., now we'll play..." It's hard to avoid, but he did. He's obviously got some standard takes. Like the balcony joke that only Canberra understood... And the young drummer who's invited onstage. He did this at his 2011 Canberra concert (although this drummer was younger - 7 years old). How does he find them? 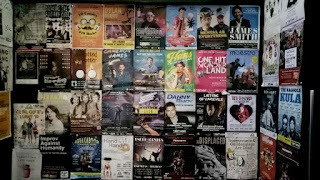 And there's a string of feature performers that appear through the night doing all manner of styles. 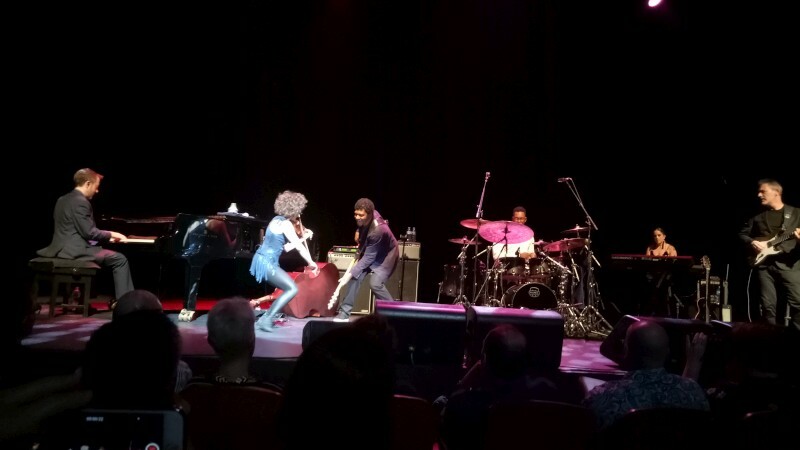 Here it was an acrobatic violinist (as last time), a female soul singer (as last time) and an operatic tenor. The tenor was new but the songs weren't: Time to say goodbye and Nessun dorma, no less. The pop hits of tenor arias. We duly clapped when we recognised the tunes. 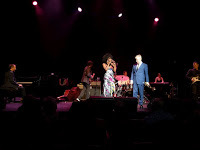 And a string of massively popular film tunes, Cinema Paradiso and Gabriel's oboe, and popular tunes, The look of love and Donny Hathaway and Roberta Flack, and some jazz, My funny valentine as an encore and Blue in green from Kind of Blue (at his 2011 Canberra concert, the Kind of Blue quote was Flamenco sketches). And he came down to the audience, this time playing only a few seats and one row from us. As did singer Sy Smith. Our seats were great: 4th row, centre. And in refreshingly non-corporate style, he invited pics and videos, jokingly requesting that we don't publish a video if he plays flat. Not that I thought he did. The musicians were impressive and very professional and part of the show: some up front, jokey, showy; some quiet but present; the guitarist just plain latin cool. 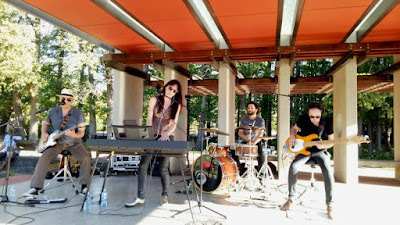 I was surrounded by middle-aged who wouldn't attend jazz, but they were exposed to some piano chromatics and driving jazz rhythms and searing fusion guitar when the core band played. The piano trio was great and easily dissolved into some sinuous contemporary jazz behind Botti's melodious and often quick trumpet and this quartet was augmented with keys and guitar for more ordered but often searing blows. There's nothing like a searing guitar solo. The violin and various vocals added for their features. So, this was underlaid by jazz but sourcing input from a panoply of popular forms. And it worked. Everyone (yes, virtually everyone in the theatre) was up clapping on 2-4 at the end (we were warned against 1-3). All well presented, well played and well insinuated and downright entertaining. Not high art, perhaps, but worthy and capable and involving and great fun. And they are playing throughout the world on an almost daily basis and filling houses and all the while insinuating some impressive jazz musicianship. I'm on board. In fact, I stood up too. 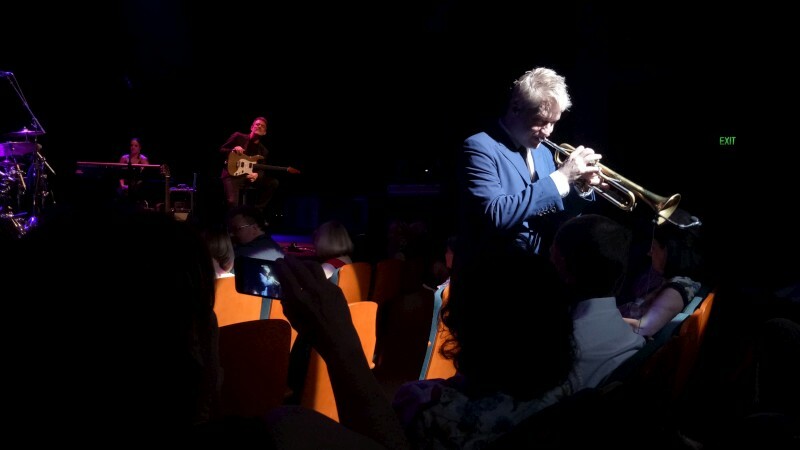 Chris Botti (trumpet) appeared at the Playhouse with Geoffrey Keezer (piano), Reggie Hamilton (bass), Lee Pearson (drums), Leonardo Amuedo (guitar), Rachel Eckroth (keyboards, organ) and feature players Sandy Cameron (violin), Sy Smith (vocals) and Rafael Moras (operatic tenor). They called it Lakespeare and it was free Shakespeare in Glebe Park. Borrowed from NYC. Not quite the first Shakepeare in the open in Canberra but nice to see it return. 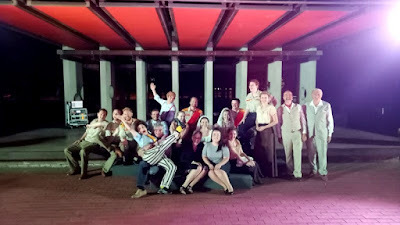 This was Much ado about nothing, Shakespeare's comedy of a two couples leading to weddings, playful in intent if often ill influenced by intrigues. Red the plot. 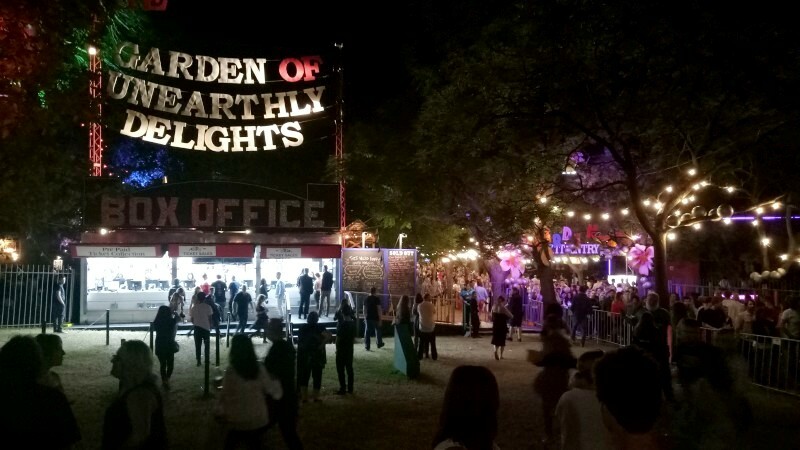 His comedies can be reasonably intricate with characters and out-of-time enough for us to chuckle at sexual and social mores (the women in front of us gave out a few belly laughs). But it works out in the end, the pairs of lovers pairing, the intriguers vanquished by the most unlikely of plods. It's out of time with Shakespeare's language that's also dated, but I find it works when it's spoken (harder to read). 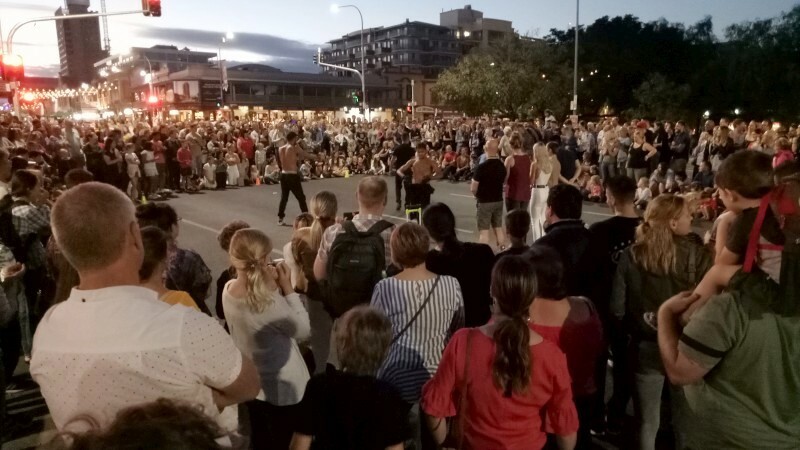 I felt it was particularly well-staged for the circumstances, all performers mic-ed through a PA, so we heard the lot clearly, and entrances through the audience and even some action, where characters hide an overhear thing, huddled amongst the audience. There was slapstick and family parties and lively repartee and it worked. This was going on 2.5 hours but the audience of 1,000 stayed and laughed throughout. The lighting was limited and the scenery non-existent, but the intent and comedy and action were there and effective and the words easy to follow. So thin was a sinner. I can only look forward to more of it. Lakespeare presented Much ado about nothing in Glebe Park featuring Lexi Sekuless (Beatrice) and Duncan Driver (Benedick). I once attended the Globe in London and I was amused to find the entertainment, singing and dancing, that accompanied the play. 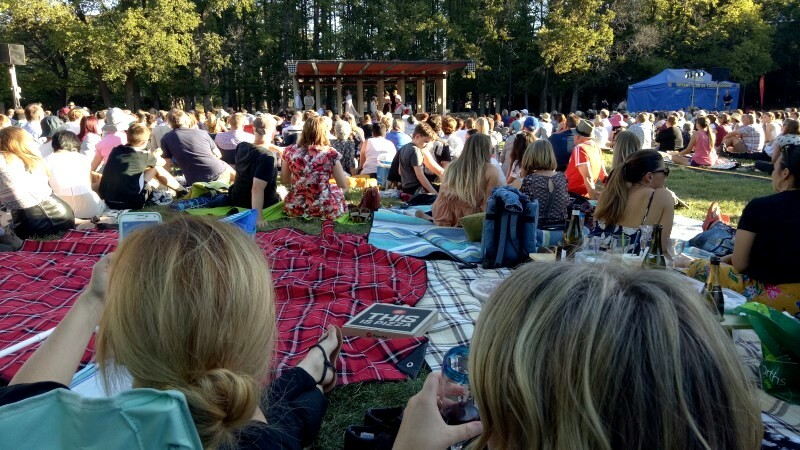 This was Lakespeare, a free public performance of Much ado about nothing, at the public stage in Glebe Park. 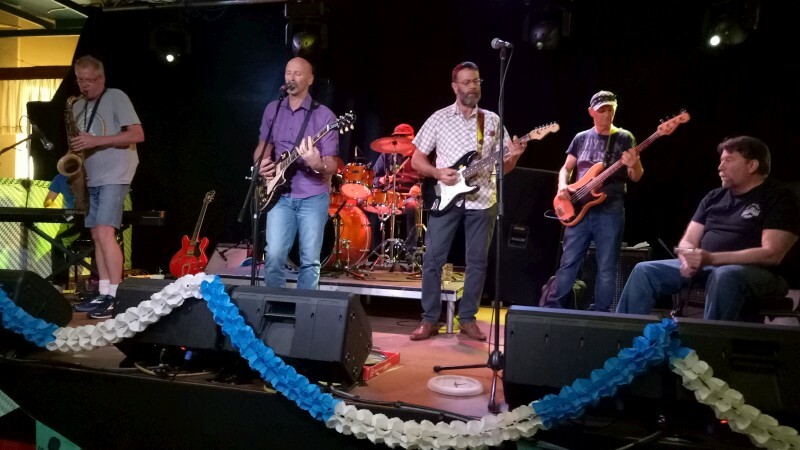 First up was a popular band led by singer Sunny Amorena. This was interesting popular music, fairly simple rock grooves but the purposeful lyrics. Sadly I mostly missed the lyrics, but some titles were Waiting and Never giving up and one theme was as story that Sunny had experienced in LA, of speeding youths and police (I didn't catch the outcome, but I can guess) and her latest single, Boys like you. All sounding very relevant and personal and well felt. The playing was good. I particularly like some capable guitar solos from Don Miller-Robinson, once of the very successful pop-rock band Dragon. I was up close up for some of the time and was amused by the onstage sound, all drums and some voice and nothing else: they were all using in-ear monitors with no stage monitors or amps (for guitar, bass or drums). But a nice, if short, set from Sonny and mates. 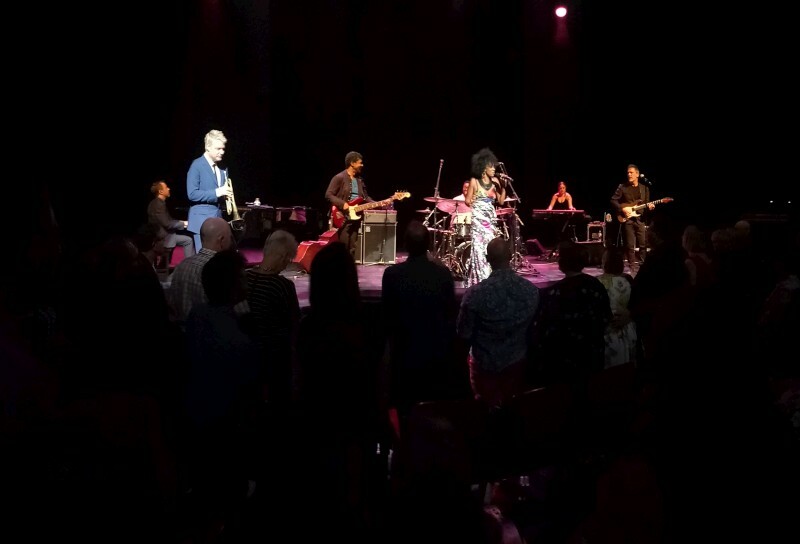 Sunny Amorena (vocals, keys) performed before Lakespeare with Don Miller-Robinson (guitar), Tony Mitchell (bass) and Rafael Salem (drums). First up at Smiths for a while. This was the Pratt/Price Collective so I knew it would be good but I was unprepared for just how good. Daryl Pratt is renowned and Mike Price was guitar an head of the Jazz School. No slouches. With Brendan Clarke and percussionist Jess Ciampa. I didn't know Jess and no drummer, so odd. So I thought. 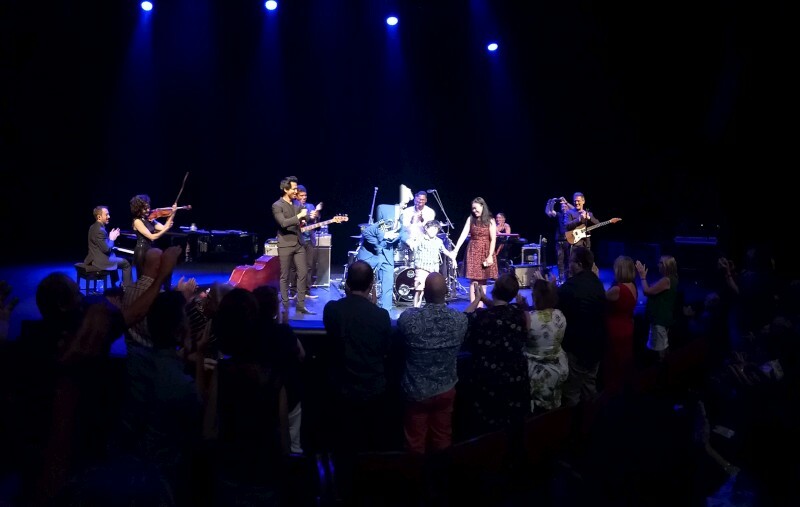 But this was an evening of latin and Jess was sitting on a cajon with congas and bongos and a string of small instruments and so, so relaxed and precise. As it was all round. Daryl was hugely fluid, perfect time and ease and melodic lines to die for. Mike was quick and lithe and listening back (I recorded) gave such easy and tonal lines, alive with easy quickness. Brendan is just a master of the bass, big toned, perfectly grooving, quick and responsive and well intoned. 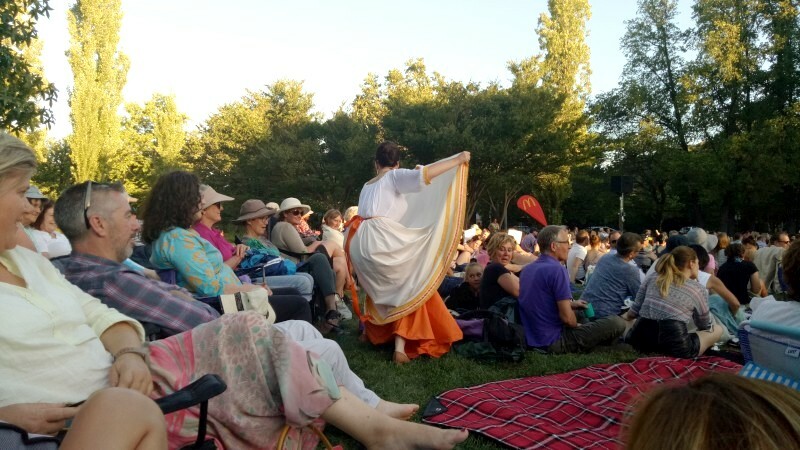 Jess' accompaniment was the essence of relaxed warm latin lives, sharp, quick with apt fills and elaborations then playful with flows from the bell tree. All so blissful and easy but also sharp and alive. Rhythms to flow with, to dance and mingle and seduce. Earthy and embedded. One tune they had never played, in practice or otherwise, and knowing that, you could pick up some reticence, but still it was good. They used to play together, but that was 18 months back. You wouldn't know it, playing as they did as masters of the craft. They were off to the studio for the next 2 days. What comes out can only be longed for. 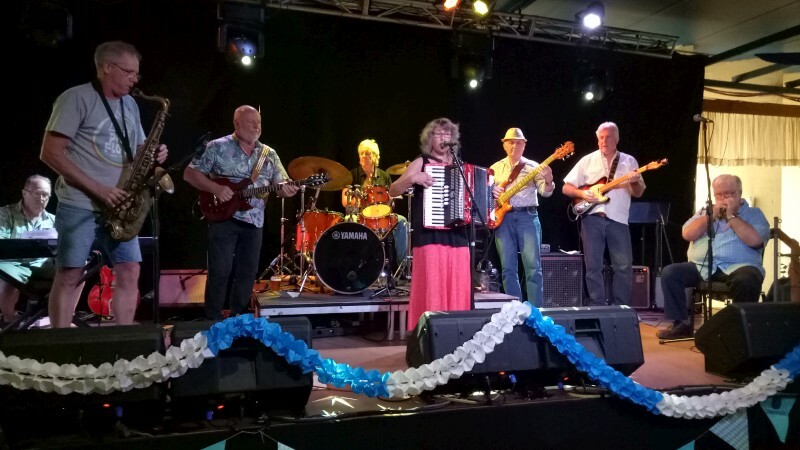 Fabulous playing, nonchalant poise, insouciant but enticing rhythms of Cuba and the rest. This was latin heaven from original pens. 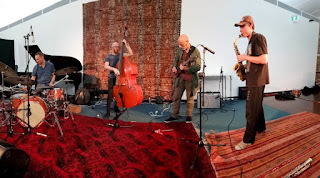 The Pratt/Price Collective played at Smiths Alternative. 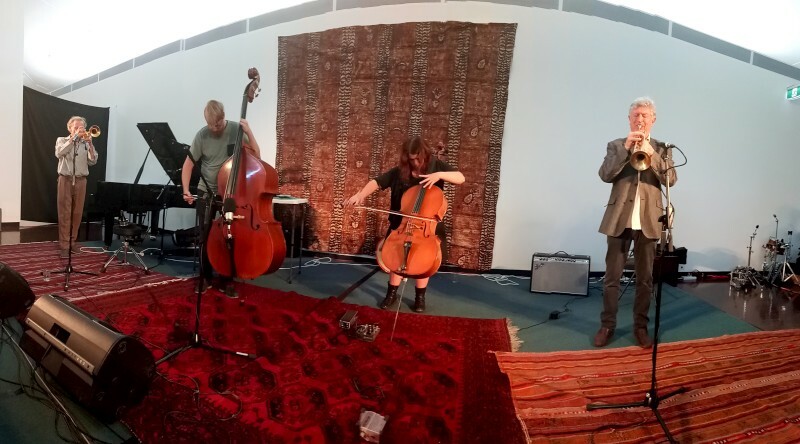 The PP Collective comprised Daryl Pratt (vibraphone), Mike Price (guitar), Brendan Clarke (bass) and Jess Ciampa (percussion). 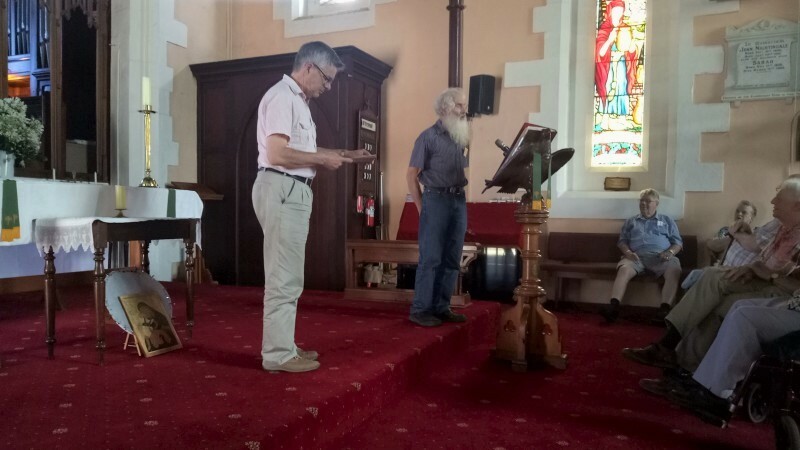 My SoundOut this year was limited to the Sunday afternoon and a workshop. Five groups played: these two seemed to me to reference standard techniques a little more. I say that advisedly, a little more. These were still wildly atonal but notes were played on instruments. The first was loud and driving and outlandish and ridiculously exciting with high skill levels applied with rapacious excess. From the first notes, with little letup. I knew Paal from the workshop and he was driving and intent but still working around clearly underlying rhythms. I found myself tapping away to the strong but disguised grooves. Danish/Berliner bassist Adam was a force of nature, playing acoustic (other than a little condenser mic on a stand), high action with Spirocores, no pickup or amp, German bow intriguingly hanging from a hook on his belt (great idea!). Melbournite Ren Walters on pick and finger-picked guitar and Scott McConnachie on alto and sopranino sax. He did a great job, again wildly atonal but wonderfully formed phrasing and with a sopranino tone t die for, so rich and full. The second band was a mix of brass and deep strings. Johan Moir on bass and Judith Harmann on cello, variously playing open accompaniment or following leads from the brass and fascinating sparing trumpet pair of our local Miro and Austrian Franz Hautzinger. I reckon trumpet is by nature a melodic instrument and we got that here from both players, but also slathers and exclamations and counterpoints and flashes. A seriously interesting interplay from two expert trumpeters and a few very interesting sets. Paal Nilssen-Love (drums), Adam Pultz-Melbye(bass), Ren Walters (guitar) and Scott McConnachie (alto, sopranino saxes) played a set at SoundOut 2018. So did Miroslav Bukovsky and Franz Hautzinger (trumpets) with Johan Moir (bass) and Judith Harmann (cello). It's all free improvisation at SoundOut, but there are degrees of freedom. It's usually played on musical instruments, sounding as expected (and intended?) or not. Sometimes it's played on anything, with mics and various noise sources. Or the instruments are prepared with cloths or bells or clips or other so the strings or bells or tubes don't sound as normal. The sticks on strings and between strings and the clothes line clips and perhaps blutack as classics. Then the range goes through to instruments played as instruments, with various atonalities and implied all. Here I can see the references, the skills and the rest that I admire. Or I think I can. 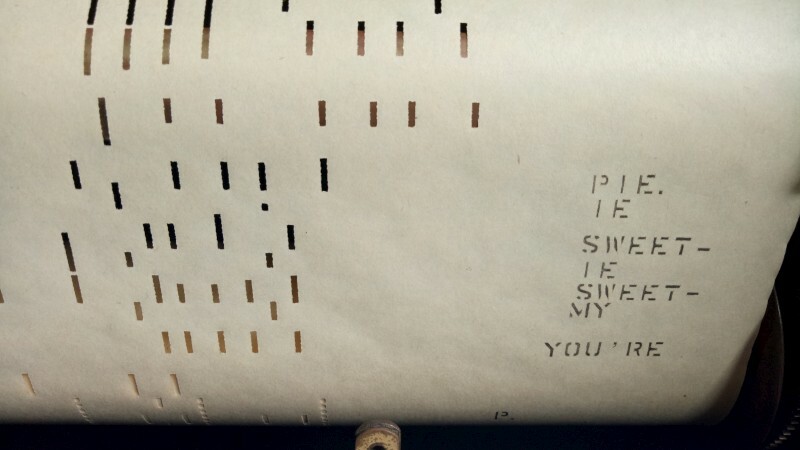 I remember asking a pianist whose playing I'd admired about keys and such technical matters. Nope, nothing. I'd been fooled. Or maybe they just don't talk of that. 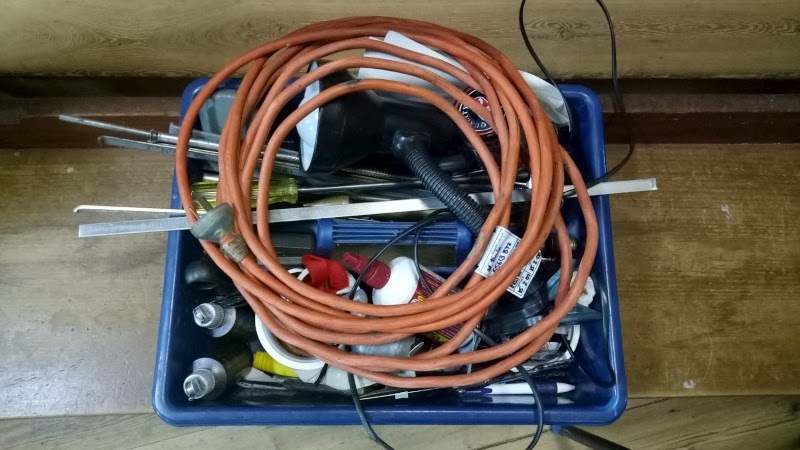 The workshop talked of all manner of things, but assumed players "know their instruments": a big ask but not the matter of concern. 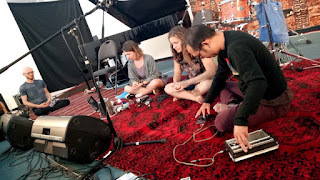 There were several groups who played with noise, with non-instruments or newly electronics. First up Alexandra Spence, Bonnie Lander and Goh Lee Kwang. Close listening to match voice, (for a little time) drone clarinet, electronics and papers and a mobile phone ap (presumably a sequencer of some type) triggering tones to an old radio as amp. Odd but small, quiet and an easy lug. Then a quartet of Ben Drury, Casey Moir, Julia Reidy and Millie Watson. I was blown out by atonal piano laying by Millie (and singing by Jennifer Nell who sat next to me for this set) at the SoundOut workshop but none of that here. This was plucks and sweeps on piano strings with lightly suggested rhythm from 12-string guitar and double bass noise and restrained but very inventive effected vocals from Casey. Again, fairly quiet but listening. 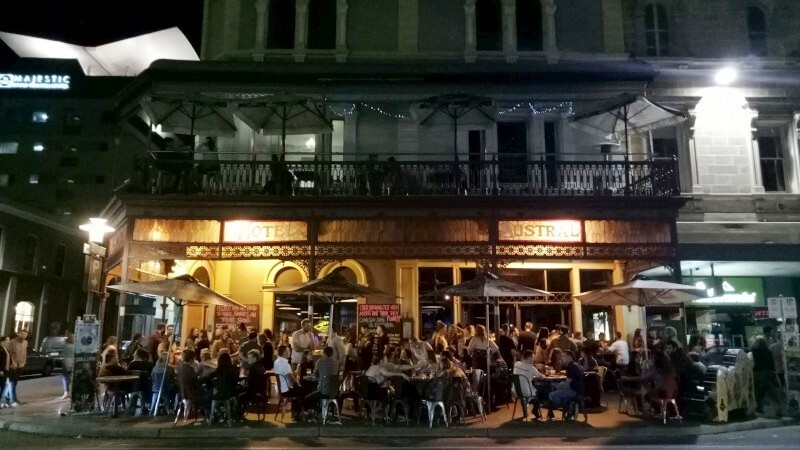 Psithurism Trio are Rhys Butler, John Porter and Richard Johnson and are locals. They played a set with Alexandra Spence, this time on clarinet, and altoist Georg Weissel. A free, open, listening thing with plenty of noises, removed mouthpieces, clacks and drones and taps: noise informed by real instruments. 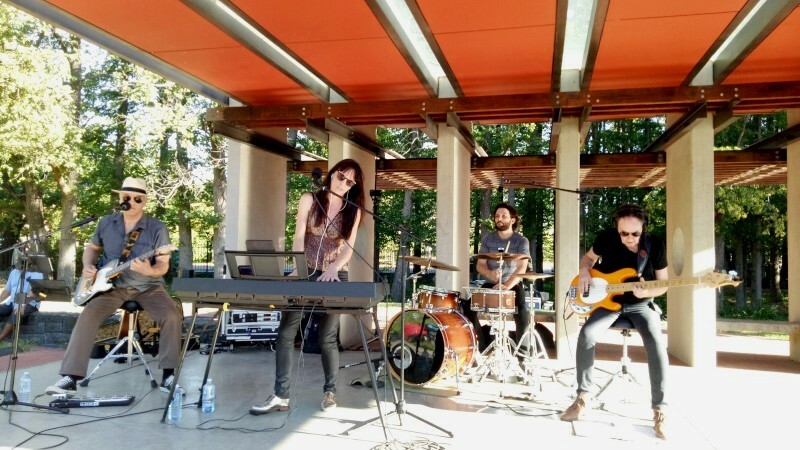 These were the obscure, open, relatively quiet improvs of the Sunday afternoon at SoundOut 2018. Alexandra Spence (clarinet, electronica), Bonnie Lander (vocals) and Goh Lee Kwang (electronics) performed at SoundOut 2018. 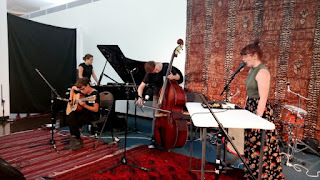 Ben Drury (bass), Casey Moir (vocals), Julia Reidy (guitar) and Millie Watson (piano) also performed. Psithurism Trio played with Alexandra Spence (clarinet) and Georg Weissel (alto) at SoundOut 2018. 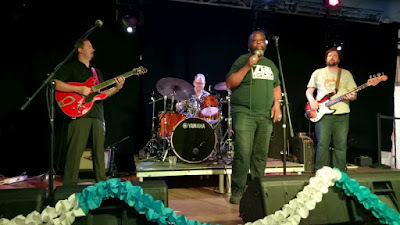 Psithurism Trio are Rhys Butler, John Porter and Richard Johnson. 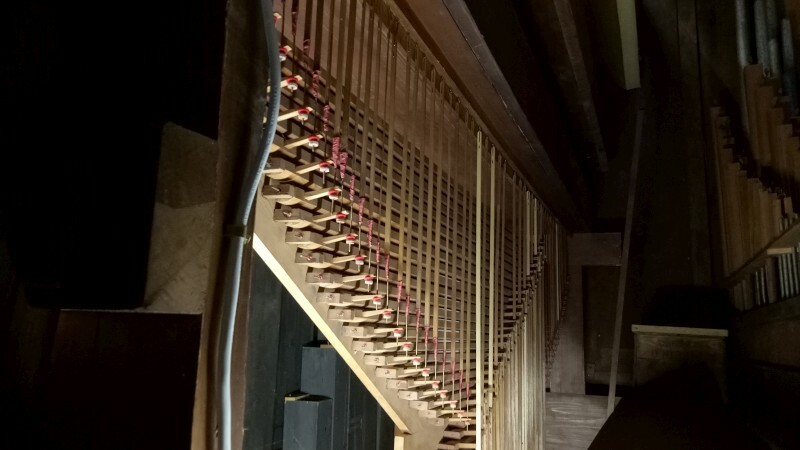 From organs and early music through to experimental improv. Wow! Extreme. This was one workshop that preceded SoundOut. 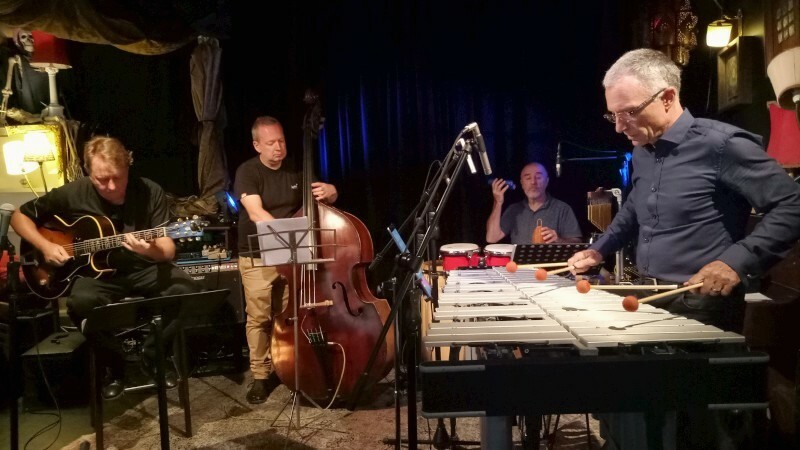 The performers were a duo that had played together for 20 years, Swedish pianist Sten Sandell and Norwegian drummer Paal Nilsen-Love. They started with a relatively short improv and it was stunning. The Steinway helped as it sounded so, so good under Sten's hands. 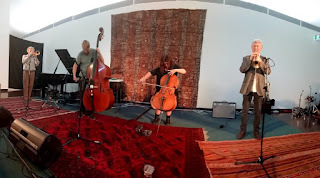 I can find noise-play rather trivial, and it was a large content of the Q&A session, but their playing was richly informed, outrageously atonal but utterly convincing. Both had a rich a history in other musical forms, classical, jazz, rock/pop, but ended here. Both listen to all manner of musics. I enjoyed their interplay but cherished the rich and expansive atonality and their underlying sense of beat. There were plays with sound, plucked strings and harmonics and pedal plays and scraped cymbals but with purpose. Fabulous but too short. 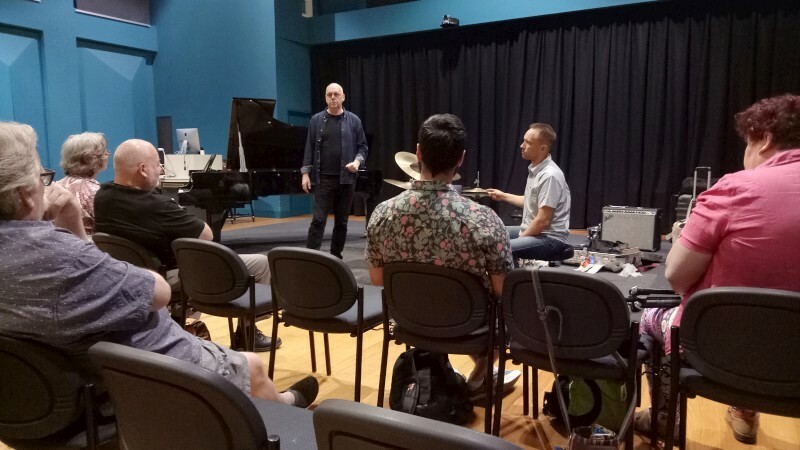 The workshop had questions on form, preparations and piano pedals, compositions, influence of audience, this music and venues (eg, jazz clubs and managers), the seeming "contradiction" of recording this music, practice, having fun, being clear in performance, listening. I found it unsatisfying that the discussion about practice and learning this style just assumed that you "know your instrument". I thought this was what the practice was for. And interestingly but perhaps not unsurprising, Sten said he doesn't perform with an e-piano. That must limit venues these days, but this is a special art with its requirements and listeners. Then the workshop. We formed a circle for exercises, passing sounds one to another and, most interestingly, all following or responding to the lead of one player. It was here we got a feel of the effectiveness of this style. 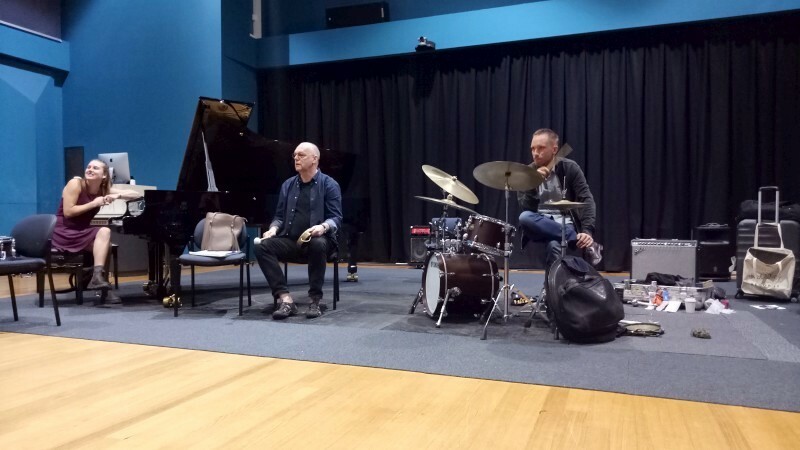 But what wonderful playing from these two, atonal and polyrhythmic and the rest but with deep references and the most satisfying and convincing free improv. 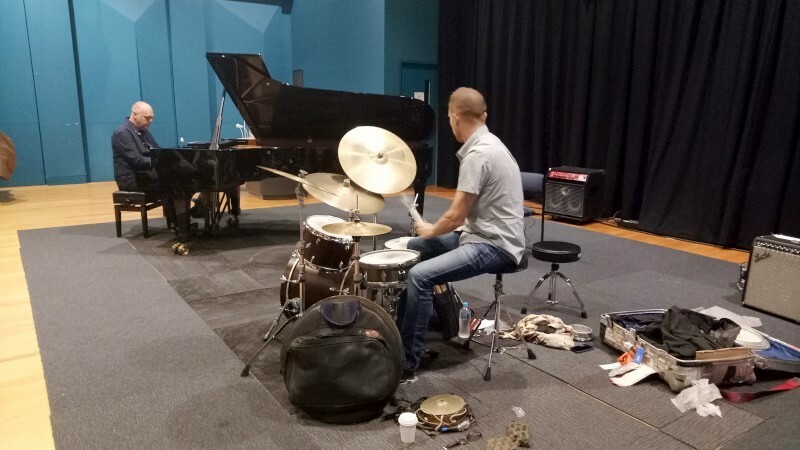 Sten Sandell (piano) and Paal Nilsen-Love (drums) have a workshop for SoundOut 2018. The first and final concerts are the biggies and this final concert was no let-down. Heinrich Ignaz Franz Biber Missa Salisburgensis with a few other pieces by him, a Dixit Dominus, a sonata and Plaudite tympana. But how big and impressive are these works! The Missa is scored for 53 in 5 choirs (2 vocal and 3 instrumental), two “loci”comprising trumpets, timpani and sackbuts and two continui comprising organs, cellos and one double bass. 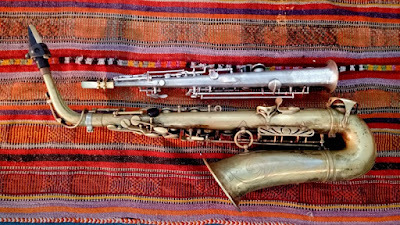 All period instruments. The Pauldite also for 53, the Dixit for 32 and the sonata for a mere 6. This was all busy fugal writing for voices and strings, ecstatic brass and timpani. Loud enough to fill this large cathedral (which will dwarf most music) so we could sit back and relish the indulgence. You do wonder how much can be written around a few words (just the Kyrie went on for ages, I think with several movements) and how often Amen will repeat and how blaringly elated one piece can be. This was so. 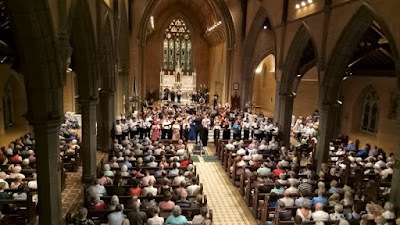 The concert drew in the locals, as the turn-out was big, filling the Cathedral. There was some lesser voices (not surprising given the fugal solo lines passed through the choirs) and some other slips, but this was a mammoth effort and a huge success. Congratulations to a large and varied group for pulling off an ecstatic concert. Loved it as did all the rest. A fine end to this modest but intriguing festival. I’ve talked several times of different styles at this festival but this takes the cake. 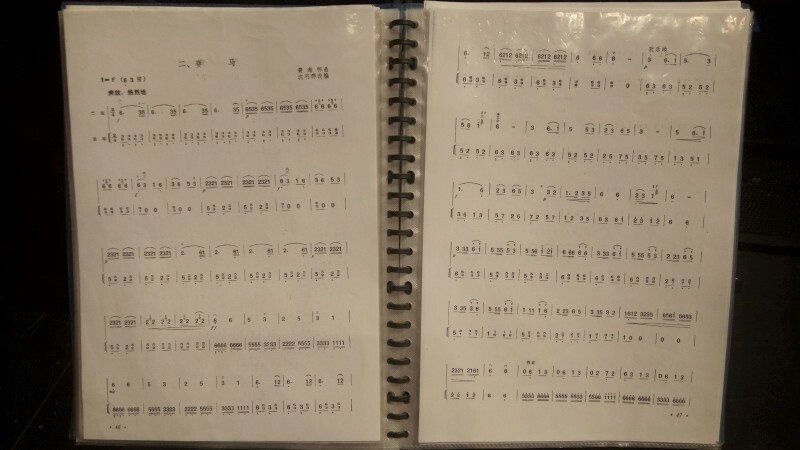 The penultimate concert was the Australian Chinese Music Ensemble playing traditional music of China (and Danny Boy and Click go the shears). It’s a fascinating and diverse sound for our ears. 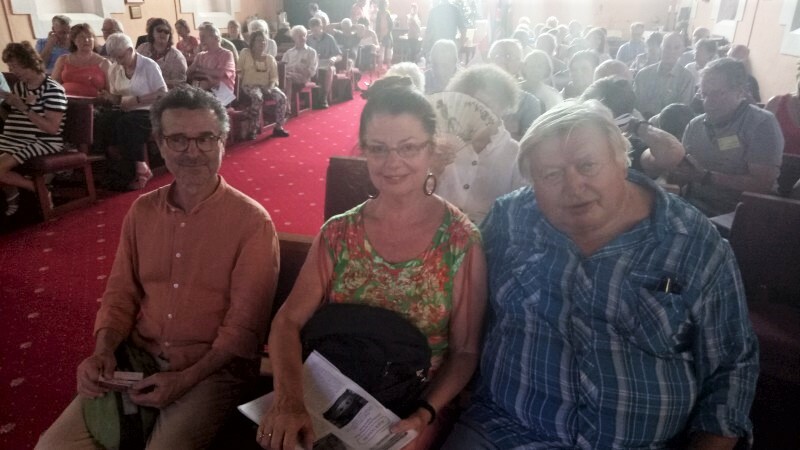 We’ve mostly heard it before but even so, getting some chatty background and hearing the individual instruments playing solo and especially being invited on stage after to see their scores and instruments close up and ask a few questions was fascinating. We heard of the pentatonic nature of the music, how it’s mostly now written with a number notation (jianpu) with dots above and below for octaves and a second stave for accompaniment. The pentatonics are comfy for us but the vibrato and pitch bends are strange sounding as are some tones. 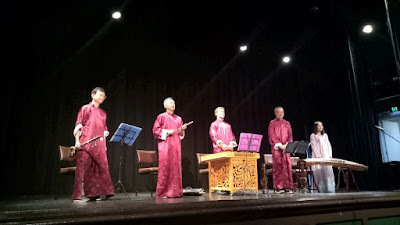 The core group was four males, joined by a woman for a solo on Guzheng. Interestingly, this instrument is mostly played by women and , at least here, she played solo. But then retuning is not trivial. Suffice to say, very different from the rest of the festival, informative and satisfying. The Australian Chinese Ensemble performed at the Ballarat Mechanics Institute. Wang Zheng-Ting (director, sheng) led a group with instruments dizi, erhu, yangqin and guzheng (names not provided). Again the Venetian group Trio Leonardo unavoidably had viola replaced, so their performance was impressive but not like a long-standing group. It would be interesting to hear them with standard membership. Not that replacement Lawrence Jacks didn’t do a great job: he did an excellent job (he’s a retired player from WASO and MSO, so not unexpected). But the group had only rehearsed this material twice ant it’s not trivial stuff. This was high impressionism, Faure and Debussy, all space or floating air or urgency. They did it well. It’s not a style that I love and I wondered how an Australian group might play it. I expect quicker, more dispassionate. I wondered it it’s a thing of the new world, newer surroundings and the rest. But an impressive outing playing a vastly different style from what we’ve heard in this festival. 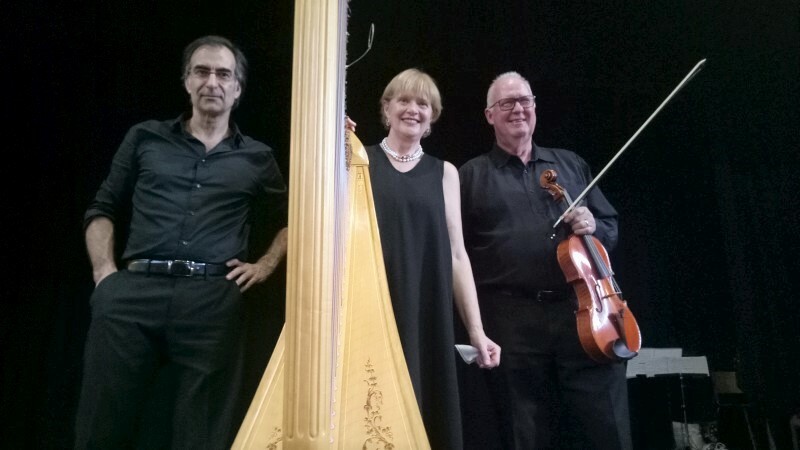 Trio Leonardo performed at the Daylesford Town Hall. TL are Andrea Dainese (flute), Elisabetta Ghebbioni (harp) and Lawrence Jacks (viola) sat in for Giancarlo di Vacri. Apparently that’s the generic term for orchestrelles as player piano is for the pianola. 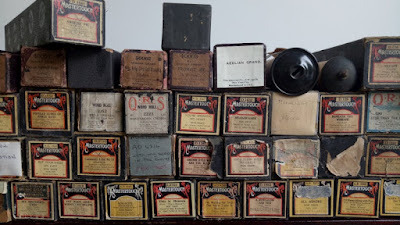 We were invited to Damon O’Donoghue’s home to hear several Aeolian Orchestrelles. Damon restores these machines. Apparently Mark Twain had one. The company was huge in its time, a US company producing player organs and pianos. These are instruments that play organ or piano mechanisms from a reel of performated paper while the performer chugs away at bellows and, for the organ switches stops. I arrived during the final movement of Beethoven 9th – the best thing I heard. But we had several others. 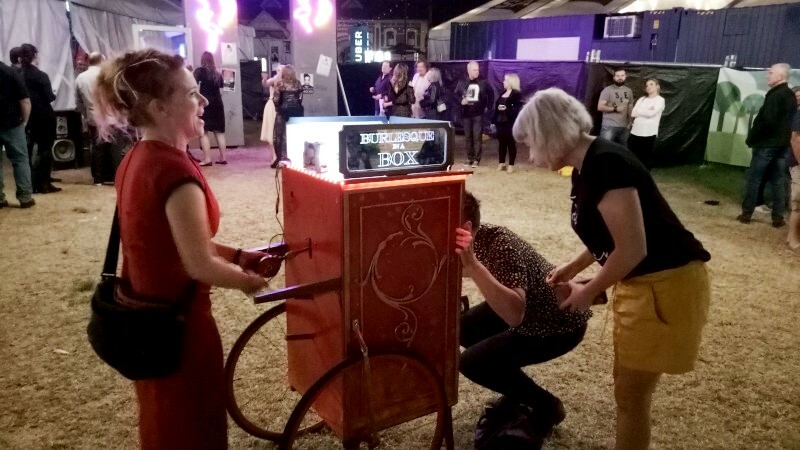 The Canberra connection: Damon was the man of the Australia Fair Grand Concert Street Organ who used to play at Floriade. That was a sad loss. Damon O’Donoghue demonstrated several Aeolian Orchestrelles at his workshop in Daylesford. 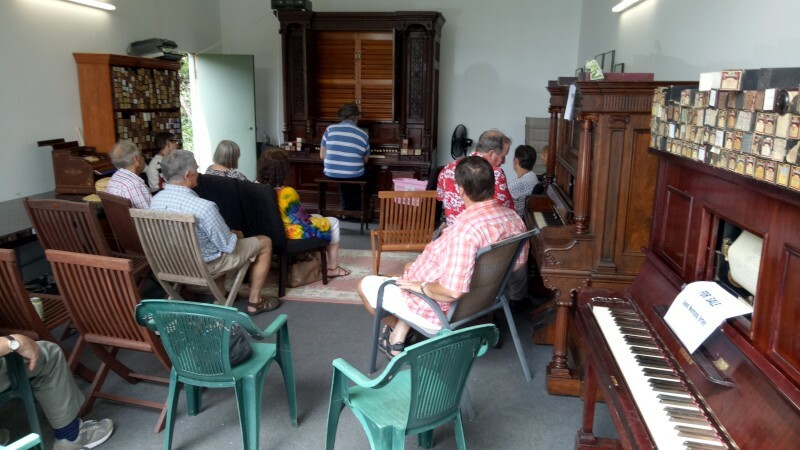 Next up was Douglas Mews, another NZ organist (it was noted! 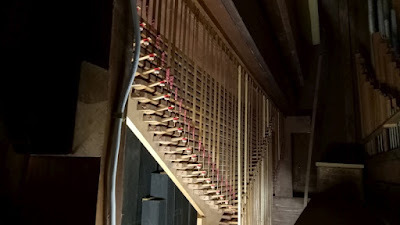 ), playing another early mechanical action organ after further last minute repairs from Ken. Douglas actually played one short concert twice, although opening all stops was only attempted n the first run. Apparently the bellows weren’t up to it. This was music from the Fitzwilliam Virginal songbook, mostly by William Byrd but also one self-portrait by George Farnaby. Douglas told us of the virginal and this music collection, how all keyboards of the era were called this in those times, about possible connections to the Virginal Queen (Queen Elizabeth) or to the virgula, a component in the mechanical action. I’ve been checking the tuning of the organs we’ve heard. Most have been ~A=444; St Pat’s was low, ~A=336. 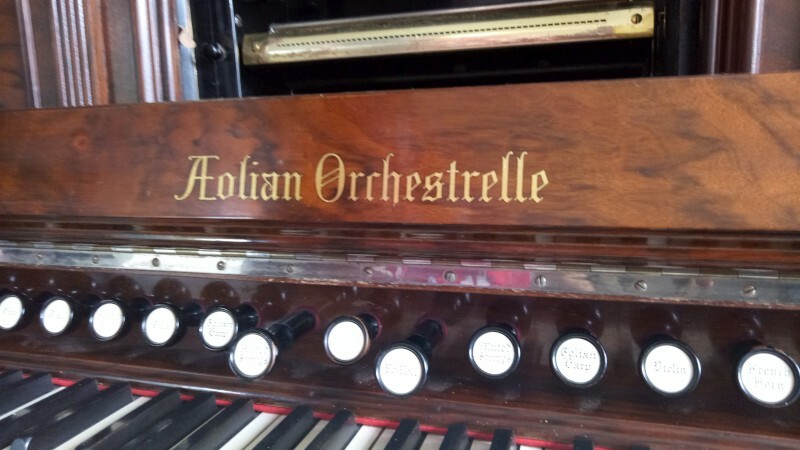 Interestingly, this was the one organ that was pretty close to A=440. It’s a matter of original construction (cheaper to build shorter pipes, was suggested) and tuning and expectations at the time, and Ken said it’s not feasible to retune whole organs. 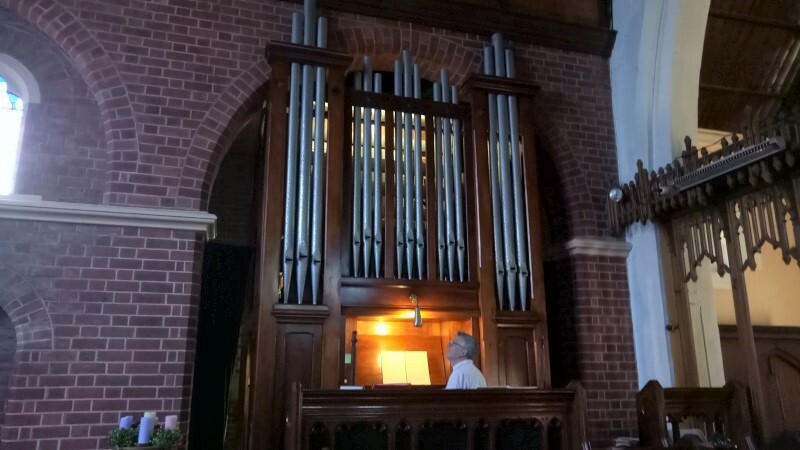 More organ lore..
Douglas Mews (organ) performed at Christ Church Anglican church in Daylesford. 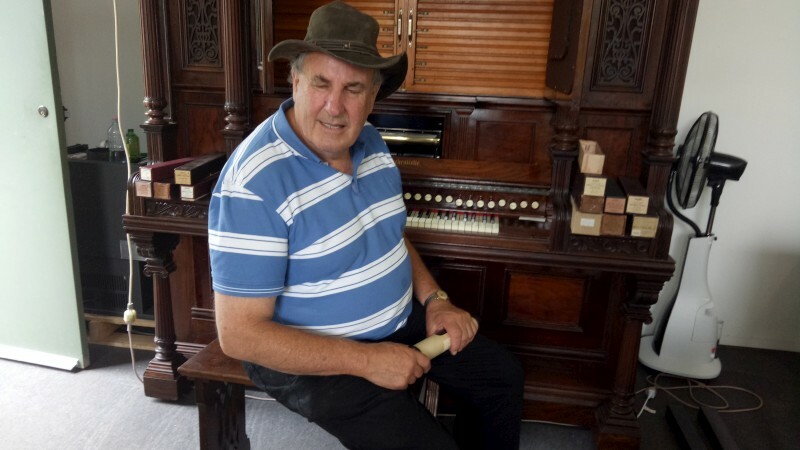 Ken Turner (organ repairman) of Goldfields Pipe Organs is performing multiple repairs during the festival. Cheers also to Nello Catarcia, the organist from Orvieto Cathedral, Italy, who dropped in and played a few bars.